This problem is in part externally generated, by the failure of prohibition to reduce substantially demand for illegal drugs in the United States and Europe, and by the failure of the United States to prevent the export of small arms or take more effective action against money-laundering. The committee should not underestimate the extent to which the United States is seen as part of the problem, rather than part of the solution, of violent crime in Latin America. It is also good for them to hear a reminder that even if you do not like Hugo Chávez, employing provocative measures backfires. I am guessing these were not the desired outcomes for the law's supporters. The State Department's 2011 Trafficking in Persons Report is a disturbing read. Beyond the horrific details, however, I was amused to see how ideology colors the Latin America entries. Many countries are portrayed as not combating human trafficking enough, but making strides in that regard. But it comes as no surprise that the countries viewed as neither combating nor making strides are the U.S. government usual suspects: Cuba, Ecuador, and Venezuela (though this time around Bolivia gets a pass). It doesn't really matter what any particular State Department report is about. They could issue one focused on the number of clowns per capita, or which countries have the best beaches: Cuba, Ecuador and Venezuela will be found to be noncompliant. "Our position on the law hasn't changed. We oppose it as written and that won't change until the courts decide what the law is," he said. "But we think the All-Star game is a chance to celebrate the contribution of all baseball players - including our international players." That's pretty weak. Once the courts rule, then they will support it regardless of the ruling? And the question remains--will Adrian Gonzalez boycott the All-Star game or not? Hugo Chávez has now been absent from Venezuela (and he hasn't been seen since June 10) long enough to generate rumors of his death, then angry counter-responses that such rumors are coup-mongering. Or was it prostate cancer? No, not cancer, and he'll be back by July 5! And did he violate the constitution? No, he didn't, and stop dreaming! There's nothing like a good presidential rumor, but these are just distractions from the more important issue, which is leadership. Chávez's movement, and the PSUV more specifically, can actually become stronger if there is a collective effort to foster new leadership in response to this episode. Chávez is not immortal [note: as a commenter noted, my original post incorrectly stated "mortal." I will go on the record that I do not believe Hugo Chávez is a zombie or vampire.] and should not be viewed as indispensable. As Steven Levitsky has written, Peronism has remained strong because of its flexibility--it has long outlived Perón because there was a structure that went beyond him as an individual and encouraged the cultivation of new leaders. I am not saying that the PSUV copy Peronism exactly, but rather that there is an opportunity to a) strengthen the party; and b) become an effective loyal opposition at a future point in time when the party loses the presidency. Hopefully there is not any broad support for Adán Chávez's call for guerrilla warfare. Juan Gabriel Vásquez's The Informers annoyed me at times. It sagged in the middle, but is beautifully written and engaging enough to continue on. The plot centers on Colombia during and just after World War II, as Germans (both Jews and Nazis) arrived and sought refuge. The main character Gabriel Santoro published a book on the topic, based on the story of a family friend. His father, a famous professor of rhetoric, trashed the book publicly, and the novel is about Gabriel gradually understanding why. Colombia had U.S.-provided blacklists for Nazi sympathizers, which is critical to the story. One family in particular was informed on, and the father's career--and life--destroyed. The overarching theme is that we choose to say some things and keep other things hidden, and that words (or the absence of them) have tremendous and sometimes terrible consequences--imprisonment, murder, suicide. That sounds banal, but Vásquez is very good at avoiding cliches, and weaving it into the extreme violence of Colombian political history (Jorge Eliécer Gaitán is a recurring reference). Gabriel constantly has to face a question from many different people: "You oblige people to know what they might not want to know. Why?" (p. 275). He has no good answer. The last part of the book is worth getting to, as the characters try to make sense of why some people choose to say some things and refuse to say others. It's been a few years since U.S. ethanol subsidies have generated chatter (remember all of those Fidel Castro op-eds?). In the wake of the vote in the U.S. Senate to remove subsidies for corn-based ethanol, the New York Times has a very good op-ed. The upshot is that it is costly, drives up food prices, and serves no good economic purpose. Eating up just a tenth of the corn crop as recently as 2004, ethanol was turbocharged by legislation in 2005 and 2007 that set specific requirements for its use in gasoline, mandating steep rises from year to year. Yet another government bureaucracy was born to enforce the quotas. Here is perhaps the most incredible part: Because of the subsidy, ethanol became cheaper than gasoline, and so we sent 397 million gallons of ethanol overseas last year. America is simultaneously importing costly foreign oil and subsidizing the export of its equivalent. That’s not all. Ethanol packs less punch than gasoline and uses considerable energy in its production process. All told, each gallon of gasoline that is displaced costs the Treasury $1.78 in subsidies and lost tax revenue. Meanwhile, the Latin Business Chronicle notes that Brazil has a friend in the Tea Party. For the first time ever, there are congressional interests potentially strong enough to overcome the longtime obeisance to farm states like Iowa. This is also a reminder of how screwy our system of presidential primaries is. Spend about 7 minutes to watch Franco Ordoñez from the Charlotte Observer talk about the importance of journalism and how it relates to his experiences in Haiti. He came and talked to my U.S.-Latin American relations class during the spring semester and students really responded. North Carolina doesn't get the attention of Al-Jazeera very often, but Governor Bev Perdue signed a law requiring counties, cities, and employers to use E-Verify. Here is the text of the bill. I've written about E-Verify many times--here are some basic facts; here and here are some of its problems. It is guaranteed that citizens or legal residents will get falsely flagged and employers will be burdened. If there is one thing we've learned from the Immigration Reform and Control Act, it is that immigration laws--indeed, like any other laws--create certain unintended incentives for immigrants and employers alike. In this particular bill, there are two important caveats that may well reduce the impact of the law. In fact, one of the bill's sponsors believes that in its final form the law will only cover about 20% of the state's businesses. First, the requirement does not apply to seasonal workers who are hired for 90 days or less during a 12 month consecutive period. That could ease pressure on farms, and could create an incentive for workers to bounce around farms in a particular part of the state, leaving at the 90 day mark. Second, it also does not apply to businesses with less than 25 employees. That will exclude quite a few service industries--landscaping and house cleaning, for example--and could further encourage subcontracting, which is already happening. If you go to a large company like Home Depot to purchase some service, like flooring, they will hire a <25 employee firm to do the actual work. However, one concern about the bill is that it does not require employers to check current employees. Thus, if an employee is in the country illegally, he or she has a strong incentive to remain in that position indefinitely, which means the employer can treat him or her very poorly with no accountability. Top Senate Democrats launched on Wednesday another bid to pass a comprehensive immigration reform they say will enhance U.S. economic productivity and national security even as it provides a path to legalization for 11 million undocumented immigrants. For the first time, minorities make up a majority of babies in the U.S., part of a sweeping race change and growing age divide between mostly white, older Americans and predominantly minority youths that could reshape government policies. The State Department announced new initiatives to combat arms trafficking in Latin America. The key part of that is to trace firearms, including the use of eTrace in Central America, the Caribbean, and Mexico. This is all to the good, though it is hampered by national-level realities. First, the General Accounting Office has already noted that working with Mexico on tracing is difficult because a) U.S. agencies do not work together well; and b) corruption within Mexican institutions makes it harder to develop effective relationships. In any case, it looks like pressure is building in the U.S. Congress to do something. However, the controversy over Fast and Furious, where ATF allowed high-powered weapons to go to Mexico as a way to track them, shows how bad policy is worse than no policy. Is your debt increasing? Your bills piling up? Are you getting turned down for loans because you could not pay up? Don't let it get you down. Turn that frown upside down and call China! They'll help, no questions asked. Dozens of happy less developed countries agree. Just open up access a bit to your natural resources, and the cash starts flowing in! Ecuador's total foreign debt in April was $14.07 billion, up 3% from $13.67 billion in the same month of 2010, the central bank said. The amount is equivalent to 23% of Ecuador's $62 billion gross domestic product forecast for 2011. According to the bank, the country's public debt totaled $8.78 billion in April, up 15% from $7.65 billion a year earlier. The April public debt figure is equal to about 14% of GDP. Private-sector debt, meanwhile, stood at $5.29 billion, down 12% from the $6.02 billion posted in April 2010. Ecuador has lacked access to financial markets since President Rafael Correa defaulted on $3.2 billion in foreign loans in 2008, but the Andean country has opened the door to China as Ecuador's leading lender. Recently, Finance Minister Patricio Rivera said Ecuador is negotiating a $2 billion loan with China to finance several projects. Diplomats from the United States and the whole of Latin America (except Cuba) will be meeting in Lima today to discuss the future of the Organisation of American States. The OAS is a vast, cumbersome, bureaucratic concern, generally recognised to be a child of the cold war. It is staffed by those who prefer the sumptuous salaries of an international organisation to the less regular rewards of a career in Latin American politics. Now, after a decade of insignificance, the whole future of the OAS is coming up for discussion. An impressively named "Special Committee for the Reorganisation of the Inter-American System" will be debating what can be done. It has been clear for some years that the American-inspired attempt to isolate and blockade Cuba from the rest of the continent could not be continued indefinitely. The construction of a new international organisation of the States to the south of the Rio Grande, excluding the US, is a logical development of the prodigious growth of Latin American nationalism in the past few years. Actually, that was a Guardian archive from exactly 38 years ago: June 20, 1973. It is quite remarkable that the same concerns are present today. It is testament to how difficult it is to a) reform large international bureaucracies; and b) create new institutions (like UNASUR) that can realistically replace old ones. The New York Times has an article discussing the silence of Major League Baseball with regard to a) the anti-Latino legislation in Arizona when the All Star Game is going to be held there; and b) the general trend toward taking advantage of players from Latin America, especially those in "baseball plantations" (what a great phrase). The upshot is that MLB rightfully lionizes Jackie Robinson, but sees him as an historical figure rather than a symbol of an ongoing struggle. Adrian Gonzalez, the former Padre who is one of my favorite players, has said he is considering boycotting the All Star Game. He is now (unfortunately for the Padres) on the high-profile Red Sox and is currently first in the AL in batting average, and second in OBP, slugging, and WAR. He is also highly respected so if he boycotted and others followed suit, it would make a big statement. It would not be a statement from MLB, but a statement nonetheless. The "War on Drugs" began 40 years ago today, and there are a slew of op-eds and articles criticizing it (including an NYT op-ed by Jimmy Carter). It is telling that there are no such examples praising it. This is consistent with many past polls. There is no consensus about precisely what we should do, but there is broad agreement that what we're currently doing has not worked. The more vocal opposition to drug policy has coincided with the increase of violence in Mexico. There may well be a correlation. A high level of violence in, say, Colombia, does not get the attention of the U.S. public, whereas in Mexico it does. I have to disagree partially with RAJ about her assessment of this CSIS report on Latin American civil-military relations, authored by Howard Wiarda, a political scientist who has worked for many years on political culture in Latin America. His essential argument in this report is that in many Latin American countries military intervention is constitutional. That actually should not be particularly controversial, as it has been analyzed in countless studies (Wiarda, for example, cites Brian Loveman, who has written a ton on this). Among many others, Wiarda should have cited Alfred Stepan, who I quoted here not long after the Honduras coup. Where she is exactly right, however, is on Wiarda's interpretation of the Honduras coup of 2009, as he reiterates false arguments that continue to float around despite many refutations. Clearly the thrust of Wiarda's argument is that Mel Zelaya's removal was completely justified. First, this does not differentiate between elites feeling intervention is legitimate versus the country as a whole. For example, Honduran elites clearly loved the coup but polls showed the larger population did not. Second, it suggests that the U.S. and OAS should do nothing. The fact that Latin American constitutions still have anti-democratic articles should be alarming rather than a source of apathy in the face of violence. The fact that he cites Ronald Reagan as the first president to promote democracy in Latin America gives you a sense of the policy implications of the argument. Saudi Arabia and a handful of other mostly Middle Eastern countries with excess production capacity will have to supply more oil, but global markets will need to rely increasingly on producers outside the Organization of the Petroleum Exporting Countries. With production declining in Mexico and the North Sea, the energy agency suggested that Canada, Brazil, the United States and Colombia would need to take up the slack. 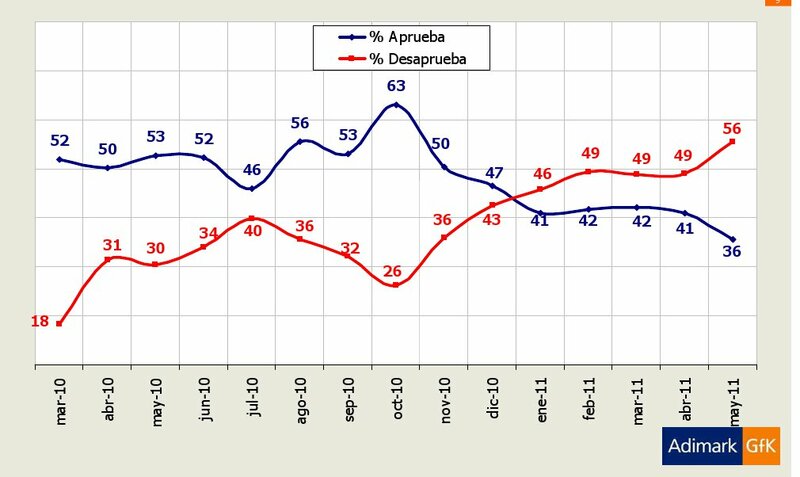 Coincidentally, I was just discussing Colombia in my summer Latin American politics course and showed this graph. Colombia is in a very good position to take advantage of this development. There are really two parts to Tom Gjelten's Bacardi and the Long Fight for Cuba (2008). The first is a history of Cuba from the 1860s to the 1960s, centered on Bacardi and the city of Santiago. The second is a narrative of how Bacardi became global and also obsessed with fighting Fidel Castro. The Bacardi company went from being an icon of Cuba to a conglomerate struggling to maintain a Cuban identity. The first part is excellent. Bacardi was in the middle of fighting against Spain and then later against Fulgencio Batista (who did everything he could to either entice or compel the company to support his government). Gjelten's describes a company that took tremendous pride in Cuba, and was even grudgingly admired by Marxist union leaders for its positive relations with labor (p. 125). Pepín Bosch, the president at the time of the revolution, even supported Fidel Castro until it became clear that there would be no autonomous political and economic space in the country. Bacardi was so enmeshed in Cuba that Raúl Castro married the daughter of a Bacardi executive (Velma Espín). Bacardi was a living example of how a homegrown Cuba industry could become global to the point that the word "Bacardi" immediately brings up the image of rum. Ironically, it took the revolution to really launch that global brand. Bacardi already had plants in Puerto Rico and Mexico, in large part as a result of concern about unstable political conditions before Fidel even became prominent, but it grew exponentially only after leaving Cuba entirely. The second part of the book is interesting, but not as convincing. Gjelten gives the company a pass when it comes to its association with terrorists like Luis Posada Carriles. Despite Bosch's support for the Bay of Pigs and other endeavors, and even helping to launch Jorge Mas Canosa's political career, Gjelten somehow comes to the conclusion that "Bacardi as a corporate entity had largely steered clear of Washington politics around the Cuba cause" (p. 331) until the 1990s. That is a stretch. At times Gjelten acknowledges a dilemma of focusing on the Bacardis as a way to understand Cuban political development: "The Bacardis were white, upper-class Cubans, and it is impossible to generalize from their lives to the experiences of the whole Cuban people, a great many of whom were poor (p. 350). But "they did love their country and were generous citizens." Yet over time Bacardi shifted from a nationalism independent of (and even skeptical of) the United States toward one that depends largely on U.S. legislation and legal decisions to defend its claims. Since 1959 both Cuba and Bacardi have changed a lot. Mesa left his young daughter and her mother behind in Cuba, he said. He didn't tell them he hoped not to return. "She's five years old. She wouldn't have understood," Mesa said of his daughter. In all, it is unfortunate that in the 21st century there is still such a thing as defection. An article in Salon about the Alabama immigration law. As I noted last week, its main beneficiary will be lawyers. But also very apparent is how it seeks to target and even criminalize citizens. If you are a landlord, you can be charged with a crime if you screw up. If you are an elected official, you can be sued. If you are a citizen of the United States, you can be dragged to jail if you happen to be outside without your ID. These trends are troubling because the population change in this country is happening too quickly and causing fundamental changes to the character and values of the United States at a time when the country is already faced with high unemployment and many Americans are living at or below the poverty line. HB33: Prohibits governments from accepting the matricula consular as ID. Passed the House. HB36: Businesses in North Carolina with more than 25 employees would have to use the E-Verify federal database to determine that new hires are legal citizens of the United States. Passed the House. HB744: Requires a birth certificate and immunization record before a child is enrolled in kindergarten. Passed the House. Given Republican majorities, I have to think these will pass. Governor Bev Perdue, a Democrat, has vetoed other bills but her views on immigration are fairly restrictionist. Despite high oil prices, Venezuelan debt has been increasing, and now Hugo Chávez wants to raise the debt ceiling to issue bonds over $20 billion rather than $12 billion. It is interesting to note that in 2007 he wanted decree powers in part so that he could decrease the debt. Regardless, Venezuela has a lot of reserves but still its debt is viewed as risky. One irony is that despite his rhetorical attacks on capitalism, with high interest rates Hugo Chávez has been making a lot of people rich. A new study will show that higher skilled immigrants outnumber lower-skilled. Rather breathlessly, the Washington Post article asserts that the finding "could have profound political and economic implications in the national debate over immigration." This is an interesting finding but I don't see how it will have any implication except at the margins. The debate over immigration is focused squarely on undocumented immigrants, who have less education and fewer skills. The debate will remain there regardless of the skilled/unskilled ratio. This is yet another sign of how ill-conceived many state immigration policies are. Georgia already just passed a restrictionist law and the governor was quite proud of it. Just one hitch: Georgia farmers are certain it will hurt them because it will drive away their only source of labor. So after signing the bill into law and saying how great it is, the governor now says he needs an expedited study of its impact on farmers and said "he wants to get beyond anecdotal evidence and look at actual numbers." Yes, you heard that right. Neither the governor nor anyone else in the Georgia legislature ever looked at "actual numbers" when making a sweeping immigration law. Now of course we wait to see how he governs (he takes office on July 28). But after all the excitement and crazy conspiracy theories, all this calm reaction is downright boring. Given all the uncertainty, I was surprised when the presidential race in Peru was called rather quickly and overnight has changed very little. The current results, with 88.4% counted, is Ollanta Humala with 51.28% and Keiko Fujimori with 48.72%. --The number of spoiled or blank ballots is 5.8%, which is lower than predicted. When push came to shove, Peruvians did want to choose. --There are plenty of news stories about jittery market but interestingly, JP Morgan says "buy Peruvian." --There are no accusations of fraud and Keiko is telling her supporters to remain calm, so could this election turn out to be...normal? All the editors who took part in the roundtable observe that it is increasingly difficult to find referees. This confirms my experience as an Associate Editor of Feminist Economics, and also reflects the crazy number of requests I get to review papers from all sorts of journals, and also on papers where I strongly doubt I have special expertise. So I’ve been wondering for a long time: is this system sustainable? Is there a way to reward referees, or another way to create positive incentives for refereeing (whether material or immaterial)? Or is there no need to ‘fix the system’? This has various parts to it, but as a journal editor for the past five years I actually disagree with the first part. It has always been difficult to get reviewers, and I read plenty on Twitter, Facebook, Political Science Job Rumors, etc. from people complaining about how many review requests they receive. That brings me to the APSR. I was really struck by, and very much identify with this note from the editors in the February 2011 issue. On a less happy note, we continue to experience some very late or ultimately non-responsive referees. We urge those referees who are not sure they can complete the review in time to decline, rather than accept and then run far over deadline-or, if unforeseen circumstances arise, to let us know so that we may assign another referee. And we welcome authors' inquiries about delay, which often spur us (and dilatory referees) into action. People who cannot be bothered to finish reviews should never accept them in the first place. Authors complain about the length of time the review process takes, but very often this is the result of waiting (while also bugging the authors) for late reviews or simply waiting for potential reviewers to respond in the first place. The fact that the flagship journal in political science suffers from this shows how pervasive this is (whether it is more pervasive than in the past is open to debate). In short, we want journals to complete the review process quickly and publish our scholarship but at the same time we screw up that process for everyone else. I can easily imagine someone missing a deadline for a review while simultaneously emailing an editor to ask what is taking so long. This brings me to the question of incentives mentioned in the Crooked Timber post. Unfortunately, I cannot think of any. It would be nice if reviewers could be paid, as they are for reviewing full-length book manuscripts, but that is obviously impossible. Ideally, quality reviews could be submitted with other materials as part of the merit process in individual departments. Even that, though, could only go so far. Is the process sustainable? Yes, there is no doubt in my mind that it is. If two things happened, the process could be improved considerably, and neither is difficult. First, editors need to search harder for reviewers. Yes, it is easiest to either do a quick Google Scholar search or take a look at the TOCs of recent top journals but these tend to generate the same names over and over. There are lots of very qualified reviewers that are not burned out and some, in fact, even email me and ask that I keep their name in mind when an article on X topic is submitted. Second, if you are asked to do a review and cannot, then always make it a point to suggest at least one other name to the editor. Further, for those reviewers with Ph.D. programs, suggest your advanced graduate students. Almost without fail, those reviewers are deeply immersed in the literature and conscientious, which leads to high quality reviews. Even just one name to the editor speeds up the process a lot. The Alabama legislature passed a law that goes even further than Arizona. For example, if you act nervously in front of police then that is reasonable suspicion that you are in the country illegally. The ACLU has already announced it will challenge it in court. The chief sponsor of the bill said that it is a "jobs-creation bill for Americans." That is not true. Instead, it will be a "jobs-creation bill for American lawyers." Thanks to one of my students for pointing out this video on Univision about Roger Noriega. In an effort to derail Ollanta Humala's candidacy at the last minute, Noriega decided to accuse Ollanta Humala of receving money from Hugo Chávez. He says he has a report with credible sources, but of course refuses to allow anyone to see it. Remember that it was only a few days ago that Noriega claimed there was a plot to make Honduras a base for Hezbollah. 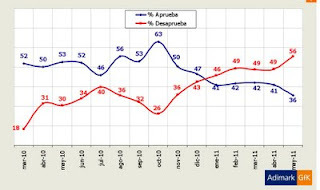 Sebastián Piñera really needs some more trapped miners because they brought his approval ratings to a high, but they are now down to 36% with 56% negative. Instead, he has the HidroAysén controversy and protests. The big question now is whether that, like the miners, will only have a short term effect. Check out his roller coaster, which is speeding downhill. First, we need to be careful about claiming a tightening race means much more than that close races tend to tighten as election day nears (presidential races in the United States, for example, often tighten). On this point, see Otto's post about a risk group's (Eurasia) take on the tightening, which I would argue is little better than flipping a coin. Second, much has been made of undecideds, as if they could really go either way. This is debatable. In the U.S., for example, there is ample evidence that most undecideds or self-proclaimed independents lean very definitely Republican or Democrat. In the Peruvian case, these candidates are very far apart ideologically, and Peru is a very unequal country, so it is difficult to see too many people feeling genuinely undecided. It is more likely that they are leaning, but choosing not to say which way. Third, there is a broad assumption that poorer people will vote for Humala and those with more money will vote for Fujimori, but it is hard to predict who might simply spoil their ballot (in Peru, voting is compulsory so it is more likely to see spoiled ballots than abstention). Jo-Marie Burt and Coletta Youngers argue that the current number is 7-12%. That is a significant percentage, but it is hard to tell whether it favors one side or the other (or neither). What does all this mean? The unremarkable conclusion that it is a toss-up. There was a flurry of analyses last year when Brazil recognized a Palestinian state and other Latin American governments followed suit. The Jerusalem Post has a very detailed (and seriously realpolitik) discussion of Israel's current lobbying strategy to ensure that Latin American governments don't vote that way at the UN. The idea is to ensure that 60 countries vote against statehood or abstain, and that if a bunch of tin-pot dictatorships vote in favor, it doesn't really matter too much. Israel might also float an alternative plan that could siphon off votes. The articles makes no pretense that such a plan would be serious--indeed, it uses the word "wink"! It would just need to get enough votes to thwart the Palestinians. Regardless, Israel will pay particular attention to Chile, Peru, and Uruguay, which recognized a Palestinian state but were vague on the borders, and convince them not to vote in favor. It is hoping that Mexico will be able to influence Central America as well.